Wood pellets are carbon neutral. Switching from coal to natural gas reduces 50% of greenhouse gas ("GHG") emissions. The pellet industry enabled the closure of polluting bee-hive burners at Canadian sawmills. Unlike Canada, the European Union has mandated GHG reduction by law. Canada's policy is to wait and see what the US does. The EU has committed to a 20% GHG reduction from 1990 levels by 2020 and is using wood pellets as an important way to achieve this target. The EU mixes wood pellets with coal in thermal power plants as a way to reduce GHG. This mix, known as co-firing, can range from 5% to 100% wood pellets. Hence about 90% of Canadian wood pellets are exported to the EU. Most Canadian homes are heated by natural gas. Wood pellets are extremely cost efficient in rural areas not served by natural gas. 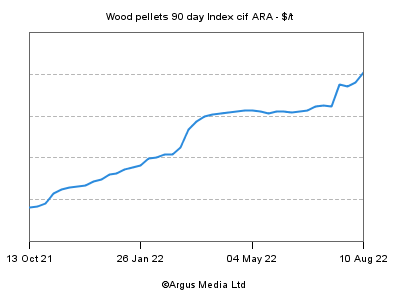 Pellets are about 25%-30% cheaper than heating oil. Canada emits 23.2 tons of GHG per capita, second only to the US at 24.1 tons per capita. Surprisingly, China and India are much lower emitters at 5.8 and 2.1 tons per capita respectively. Our association is trying to convince Canadian coal power producers to co-fire like they do in Europe and to convince federal and provincial governments to develop policy to support this. To date, the power companies and government have been unwilling. The federal government in Canada is instead promoting conversion from coal to natural gas. Ontario Power Generation previously announced its intention to convert its 3 largest coal power stations from coal to wood pellets. They have now decided to investigate conversion to natural gas instead at all but its Atikokan plant. We need to continue pursuing this agenda with power companies and government. Canada consumes 58 million tonnes of coal per year and about 90% is used for power generation in 19 coal power plants. Coal power is responsible for 17% of Canada's GHG emissions. Much of the coal is low grade lignite and sub-bituminous coal with energy content similar to wood pellets. At a 5% co-firing rate, a 2.5 million tonne per year domestic wood pellet market would be created. Feel free to download any of these documents highlighting forest management across Canada and in its various provinces.